Twenty-three faculty members at UNB have increased research, publishing and teaching support, thanks to funding from the Harrison McCain Faculty Awards at the University of New Brunswick. The awards, initially established in 2006 with a grant of $1 million from the Harrison McCain Foundation, and renewed with an additional $1.25 million in 2016, are focused in four areas ranging from support for research projects to hiring of assistants or purchasing new equipment that is critical to each research initiative. The 2017-18 awards include approximately $284,500 in support for faculty and their areas of expertise. The Harrison McCain Young Scholars Awards, which provide up to $25,000 to support new or recently hired faculty who have received their highest degree within the last 10 years. The Young Scholars Awards are designed to provide special support to tenure or tenure-track faculty members who received their PhD less than 10 years ago and whose employment at UNB does not exceed six years. The awards may be used for research projects, additional study, travel, equipment, stipends to provide release time for increased research activity, the hiring of a laboratory assistant, or other initiatives deemed to be supportive of establishing an academic career at UNB. The Harrison McCain Visitorships offer up to $50,000 to UNB faculty to enable them to participate in the academic life of another institution. The visitorships are intended to provide opportunities for current faculty to participate actively in the academic life of another institution, expanding their knowledge, enhancing their pedagogical skills and/or fostering research collaborations. The Harrison McCain Visiting Professorships offer up to $50,000 to allow UNB faculty to bring colleagues from other institutions to enrich the UNB experience. The visiting professorships are intended to attract scholars of especially high calibre to either campus of the University of New Brunswick in any discipline. The intent is to bring to UNB unusual expertise and new perspectives. The Harrison McCain Grant in Aid of Scholarly Book Publishing provides up to $5,000 in funding to assist faculty with the costs of publishing their research. The Grant in Aid of Scholarly Book Publishing is designed to provide support to UNB faculty and librarians who require funding to defray costs directly associated with publishing a scholarly, analytical book. Eleven faculty members received young scholars awards in 2017-18 while another four each were awarded visitorships, visiting professorships and scholarly book publishing grants. Jason Bell (Philosophy) and his UNB team will collaborate with a team of leading international German, Belgian, Canadian and American scholars to research newly discovered Canadian archival materials documenting the origins of phenomenology in dialogue with pragmatism. His award will be used to support four students as well as travel costs. Lauren Cruikshank (Culture & Media Studies) is tracing game-development communities and cultures in Atlantic Canada to generate critical information about the diverse and dispersed participation in the Atlantic region. Her project will, for the first time, build a comprehensive portrait of current game development practices in Atlantic Canada. Funds will used to pay salaries for research and technical costs as well as travel associated with the research. Tia Dafnos (Sociology) will examine how the federal government’s national security objective of securing critical infrastructure is being operationalized through initiatives aimed at facilitating increased collaboration with private energy and utilities. The project will focus on the energy and utilities sector in which government, law enforcement and industry have been most active in implementing critical infrastructure protection strategies in accordance with national policies. Funds will be used to hire graduate students as well as for travel costs for field work and conferences. Jennifer Day (Earth Sciences) is investigating all aspects of geomechanical design required for underground nuclear waste storage in New Brunswick, including detailed data collection at the site investigation stages, physical laboratory testing and advanced numerical simulation for excavation design. Her award will be used to pay for student researchers' salaries, attendance and travel costs for field work and conferences and required equipment for research. Suzanne Hindmarch (Political Science) will apply a political science lens to the empirical case of global antimicrobial resistance governance, which the World Health Organization has identified as a serious threat to global health because it renders common diseases increasingly costly and difficult to treat. Funds will be used to cover course release fees due to the timing required for research travel and interviews. Stefanie Kennedy (History) will research, analyze and provide worldwide access to British Atlantic slave laws from the earliest comprehensive codes in the 17th century to the laws that governed emancipation in the 19th century. The study builds on her forthcoming manuscript which explores the constitutive relationship between anti-black racism, slavery and disability in the English Atlantic World. Funds will be used to hire graduate and undergraduate students as well as for travel for research and to present at an international conference. Rongxing Lu (Computer Science) is conducting research to achieve material advances in security and privacy research in fog computing-enhanced IoT, enabling new techniques and practical tools. Specifically, the project looks to make enhancements in areas of confidentiality, data integrity, authenticity and privacy. Funds will be used to hire a PhD student and attend an international conference. Emily Read (Nursing) is examining the experience of training and implementation of overground ambulation using the Ekso bionic exoskeleton from the perspective of physiotherapists and patients and their family caregivers. She is using the funds for staff costs, conference fees and travel, equipment as well as fees for a one-week workshop at Texas Tech University. Xiomara Sanchez (Civil Engineering) is researching the effect of freezing and thawing cycles and de-icer salts on the durability of recycled asphalt. The research will assess the impact of winter conditions on Canadian roads, considering not only cold temperatures but also cyclic freezing, thawing and snow removal operations. Her funds will be used to hire a master’s student. Amy Scott (Anthropology). Dr. Scott’s research is designed to address ongoing erosional issues at the Fortress of Louisbourg by actively excavating and analyzing the individuals interred at Rochefort Point. In rescuing these remains through a large scale, multi-year salvage excavation, there is a unique research opportunity to explore the lived experience of those who were a part of the Louisbourg community. Her funds will be used for salary costs, travel to an industry conference in Edmonton, equipment purchases and rentals. Ben Speers-Roesch (Biology) is researching mechanisms and significance of winter dormancy in fishes. In addition, he plans to examine how the physiology and behaviour of marine animals respond to changes in environmental temperature. His funds will be used to purchase specialized equipment to measure the effects of temperature on swim performance and aerobic capacity in fishes. Dr. Scott Bateman (Computer Science) will be hosting Dr. Rainer Herpers from the Bonn-Rhein-Sieg University of Applied Sciences in St. Augustin, Germany. During his stay at UNB, Dr. Herpers will import his knowledge in the area of game technology, modelling and human computer interaction. He will work with Dr. Bateman, who has established the Human-Computer Interaction Lab within the Faculty of Computer Science. Dr. Terri Byers (Kinesiology) will be hosting Dr. Mathieu Winand of the University of Stirling. Through Dr. Winand’s expertise in performance management and innovation in sport organizations, he will assist in strengthening and expanding the research to regional governing bodies in Canada (i.e. New Brunswick, Nova Scotia and Prince Edward Island), thus linking regional and local sport policies, and how innovative practices are diffused locally. Kevin Englehart (Electrical and Computer Engineering) will be hosting Juan Valentín Lorenzo-Ginori of the Universidad Central "Marta Abreu" de Las Villas, Cuba. As an expert in biomedical image processing, Dr. Lorenzo-Ginoro has vast experience in experimental and analytical techniques. His mentorship will benefit students by offering lectures and presentations to enrich the student (and faculty) experience at the Institute of Biomedical Engineering. Richard Hornsby (Culture & Media Studies) will be hosting Dr. Martin Arnold of Trent University. While at UNB, Dr. Arnold will compose new music for UNB’s resident musician and the director of music as well as for one of UNB’s performing ensembles (concert band and choir, with 55-plus current members). The visiting professorship will allow Dr. Arnold to work directly with our professional musicians and our students in the interpretation of his work. 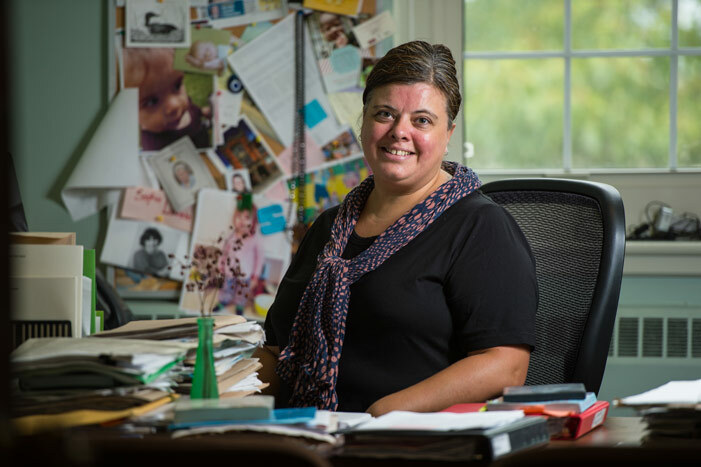 Sandi Byers (Psychology) will serve as a visiting professor with the Interdisciplinary Research Centre on Relationship Problems and Sexual Abuse housed in the Department of Psychology at the Université de Montréal. This will provide the opportunity to interact with members of this interdisciplinary group of 27 academic and 40 community researchers studying the interface between sexual violence and relationship well-being. Rick Cunjak (Biology/Forestry) will travel to the University of Zagreb in Croatia for three months to study and conduct field investigations on the ecology and food web dynamics of Croatian freshwater fishes. He will pay particular attention to a rare salmonid fish species, the Adriatic salmon (Salmo obtusirostris), a close relative of our Atlantic salmon. Janice Lawrence (Biology) will travel to the University of Bergen, Norway to research the trajectory of viruses that interact with appendicularians and will be better posed to understand the dynamics of disease transmission and develop strategies to reduce the impacts on the salmon aquaculture industry. Sasha Mullally (History) will travel to the University of Gothenburg to fully explore the circulation of ideas and people who helped create programs for early occupational therapy in the 20th century, and understand the many ways in which creativity and productivity became linked to ideas of health and well being in a variety of circumstances and contexts. Dr. Mary Blatherwick (Education) will publish Creative Dimensions of Teaching and Learning in the 21st Century. The book represents a compilation of 35 chapters written by leading educators and researchers from a variety of disciplines including: science, visual art, mathematics, language arts and media who are teaching in a time of change in which skills in creative thinking, teaching and living are crucial. She will use her award to hire an assistant to prepare images, index, proofread and copy edit the book. Sophie Lavoie (Culture & Media Studies) will publish Constructing Memory: Latino-Canadian Women Writers in the New Millennium. This book is an edited collection of texts that were presented at the VII Meeting of Latino-Canadian Women Writers, held in Montreal in May of 2016. The collection includes both creative writing and scholarly articles, including never-before-seen texts by a variety of Latino-Canadian authors from New Brunswick, Quebec and Ontario. Her award will be used to cover layout and publication costs along with copy editing and proofreading fees. Chantal Richard (French) will publish Les Conventions Nationales Acadiennes Tome II (1900-1908). From 1881 to 1937, a growing group of Acadian leaders held 10 national gatherings called Conventions Nationales Acadiennes, during which they forged a distinct identity and promoted a national agenda. This book, the second volume of three, contains all the speeches and sermons for the Acadian Conventions of 1900, 1905 and 1908. She will use her award to cover the graphic design and printing costs. Amy Scott (Anthropology) Anthropology of the Fetus: Biology, Culture and Society. Her book is a collection of articles that discuss recent and continuing research on the human fetus as an entity of biological, cultural and social significance. Its aim will be to provide readers with a multifaceted understanding of fetuses from a scientific and social perspective. She will use her award to cover indexing costs.